Today I was thankful to read the 'front page' story in the new on-line newspaper, the "South Brooklyn Post", on the battle in Red Hook, Brooklyn to get the visiting cruise ships to plug into "shore power", thereby turning off their idling, extra-dirty diesel burning engines in a practice called "cold ironing", at the Brooklyn Cruise Terminal. The story, "State Stalls on Brooklyn Air Pollution" by Lisa M. Collins (click here), was the first I've seen in the press on the subject in over a year. Anyone who has been following this blog has read about the attempt to raise awareness of the facts of ship pollution and its remedies since learning about the issue in 2005, when the City's Economic Development Corporation was planning and building the cruise terminal at the end of my family's residential street. 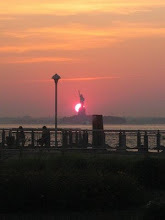 I attempted to do this first by writing letters to the City of New York, the mayor and other politicians, bringing it up at community meetings, then by starting this blog in early 2009 in an effort to push the issue further into the spotlight. "the city and the New York State Power Authority are battling over the cost to subsidize Carnival Cruise ships for making the switch from idling with bunker fuel to plugging in and paying for electrical power. Until the rates and who will pay them are determined, the project to build the electrical plug-in station is stalled." "The issue is a political hot potato—nobody wants to talk on the record about the rate dispute." “The funding is set aside, the only thing holding everything back is for the Power Authority to establish a rate. We would have expected that they would realize how important this is to the community. And that's where the press should be playing more of a role. The last part of the article mentions this blog and its attempts to raise awareness of the ship smokestack pollution issue. This being a problem not only for the Brooklyn-based cruise ships, but with all types of ocean-going ships, every one which currently idles while visiting the ports of New York and New Jersey - whether container, cruise, etc. - producing total smokestack pollution that is equivalent to that created by 7.8 Million cars. However, as far as getting this first step done in eliminating these dangerous yet avoidable emissions from our air - i.e. the establishing of "shore power / cold ironing" at the Brooklyn Cruise Terminal - that cause could have used a lot more help in the way of coverage by the press - local or otherwise. When the case to set a new shore power rate at the Public Services Commission (PSC) was stalled in early 2009 - yes it's been going that long - there was a little press coverage of the story in the Brooklyn Paper (here), and in a story and a blog post at the NY Times (here and here). But since then, there has been almost nothing - no significant attempt in the press to raise the awareness of the issue itself nor of the important facts that were coming to light in the PSC case, no pressure put on the entities that were dragging their heels, and, as a result, no help in moving this process forward. ... where was the coverage in the press? "damage lung tissue, increase respiratory illness, suppress immune systems, aggravate breathing problems and asthma" and additionally that they "contribute to premature death for people with respiratory and cardiac disease"
... where was the story in the New York Times? 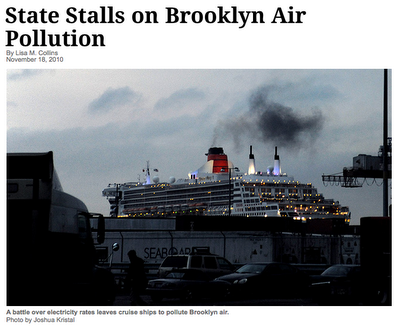 "we estimate that the annual health benefits emissions reductions arising from a switch from on board generation to shore power at the BCT (Brooklyn Cruise Terminal), adjusted for Kings County, approaches $9 Million"
.... where was the coverage in the Brooklyn Paper? Couldn't coverage of these facts in the press have leveraged a more urgent response from the PSC, or pressured the New York Power Authority to set a rate that could work for everyone - including the residents that are still breathing in these harmful emissions? On this last matter, regarding this staggering $9 Million figure cited by the Port Authority, after reading that testimony I did try to spread the word to local papers and in my blog (my post here) but was ultimately disappointed by the absence of coverage. I spoke to a reporter at the Brooklyn Paper who told me that he'd write an article about the subject, including these facts, but none materialized. I happened to bump into that reporter recently, and he told me that he had written the story, but it hadn't been published. I decided to write an email to Gersh Kuntzman, the editor of the Brooklyn Paper, to ask why this had happened, especially since he had recently interviewed a newly elected Representative and quizzed him about his lack of environmental advocacy, asking him whether lack of regulation could lead to a situation as seen in "other countries", where "kids are dying of pollution". His response to my question about the reason for not publishing the story about the $9 Million in annual "monetized health costs" to Brooklyn residents from the cruise ship pollution was not particularly reassuring. "He handles all outside questions about our coverage. I am not authorized, unfortunately, to discuss such matters." At least we have the "South Brooklyn Post". Maybe their excellent story will help to shine a light on this agonizingly protracted process, the compelling arguments that are being made about the benefits of establishing shore power, and finally push the entities involved toward a resolution. Then, finally, we'll have taken the first small step in ridding our city's air of these harmful, yet avoidable emissions. No major media in NYC have a waterfront beat reporter. This means coverage is at best spotty and at worst is often uninformed/wrong. 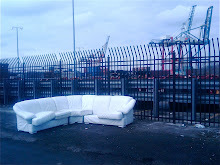 I tried reporting on the waterfront before founding PortSide, but there was no market for the product. My efforts as of early 2003 are at www.carolinasalguero.com in several sections. Adam, thanks for your great coverage on this issue. Your relentless, hard-hitting reporting ensures that nobody can forget about this issue. Nice work and keep up the fight.